Brian Keith Ousley has a birthday today. 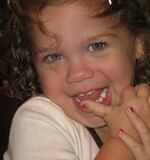 This is our 1 and only grandchild-She's 2 y/o and her name is Aubrey. We graduated our youngest child at preschool and the next day, graduated our 3rd child from high school!!!! !